Munich Airport (IATA abbreviation: MUC), also called Franz Josef Strauss Airport named, is the second major base of Lufthansa and the Star Alliance network. The airport is growing very fast and already belongs to the 30 busiest in the world. It is a modern airport which has recently become one of the best in Europe and has been declared the world. 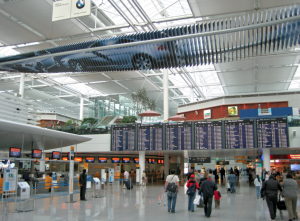 Munich Airport was praised for the quality that it offers users. The airport consists of the shopping Münich Airport Center, flanked by a long pier with Gates. On the west side is called Terminal 1, the east side Terminal 2. They are also within walking distance to each other. Terminal 2 is used by Lufthansa and partners, and Terminal 1 by the other companies. Terminal 1 is unlike Terminal 2 divided into sections, lettered A t / m E, which act as each subterminal regarding the complete handling of arrivals and departures.